I know that this photo looks more like Spring than Autumn, but I promise it was taken today! This entry was posted in Christi. I love it! So, how close were you from them? I’m guessing you were using your big ‘ole zoom? LOL…you would guess right (I was using my Canon EF70-300mm,) but I was still only standing about 5-7 feet from them. I didn’t think that I was going to get any shots today because my camera wasn’t wanting to focus and the first time I put that lens on, it wouldn’t do a single thing, but then it just seemed to work itself out…scary though!!! I do NOT want my camera to break!!! 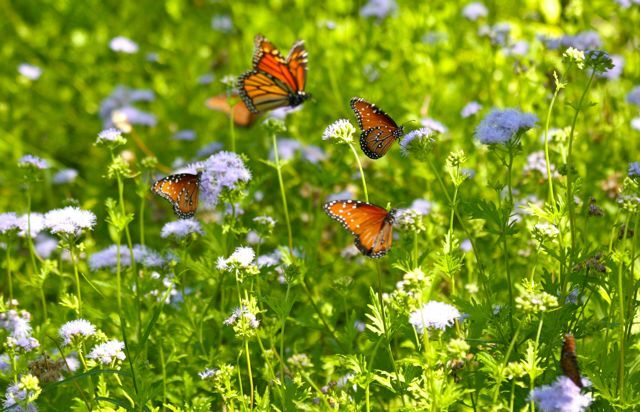 oh, just saw that you put monarchs… thought they looked a little different but those are all in the same family. I think you need to post more than this one. I know you posted some on facebook, but I think you should put some others up here! They’re awesome! THE MONARCHS ARE MOVING THROUGH!!! YIPPEE!!! I should have probably put up a more fall-ish looking version, but this was my favorite and I am going to stick to one photo per day. Very nice! And if it was taken today than it is very fall-ish. After all we need to be able to see the change through the pictures. I really like that pic it is gorgeos!!!!!!!!!! !